Get YouVersion Events at your church. We hope you’ve already been enjoying Events, one of the Bible App’s newest features (under “…More” on Apple devices, and under the main slide-out menu on Android). 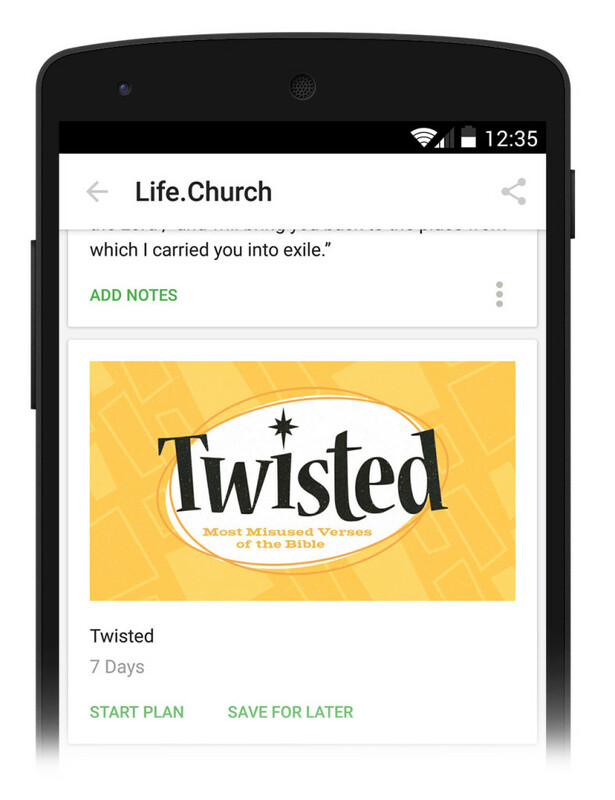 When you’re at a church that uses Events, you can open it in the Bible App to get more out of the sermon. Events lets you easily follow along with the pastor’s notes, share the Event with friends, take private notes, and save an Event so you can refer to it later. What if my church doesn’t use Events? The Discover tab helps you find services happening at your church, as well as other special events taking place nearby. 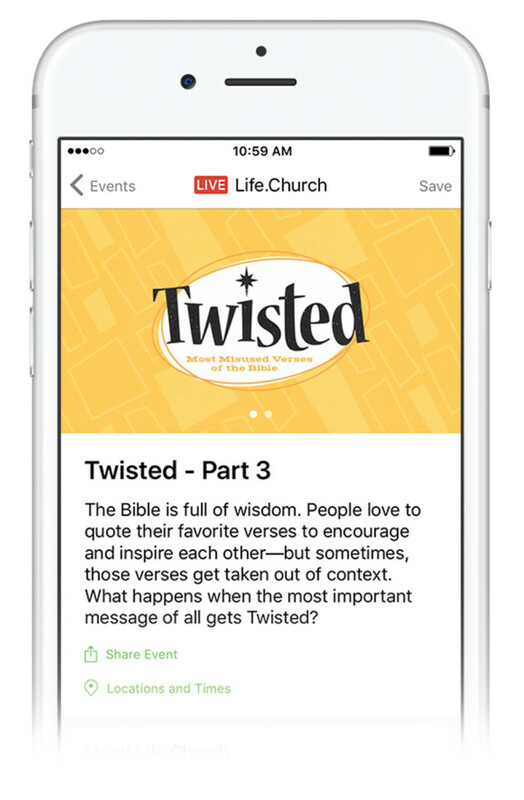 As you attend an Event, you’ll be able to follow along with its main points, Bible references, and more… all from inside the Bible App! When God’s Word begins speaking to you through a message, take notes in your own copy of that Event, saved and synced to your free YouVersion account. Share the what, where, and when about an Event to invite your friends to it. 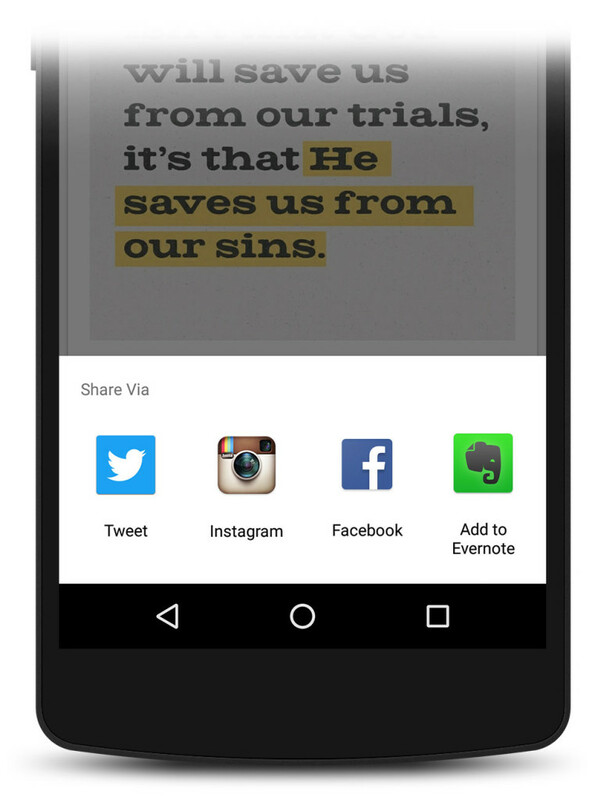 Share portions of an Event you’re attending—key points, Bible verses, artwork, and more—to your social networks. Even export the entire contents of an Event, with or without your notes, to apps like Evernote or to your email. Save an Event to your YouVersion account (including your notes) so you can study it more deeply later and still have the context. Revisit all your favorite Events whenever you want on your Saved Events tab. Discover Bible Reading Plans and Devotionals that can help you go further with the messages that resonate with you. Start a new Plan, or save it for later… all from inside an Event. What if my church isn’t using Events? YouVersion Events is an all-new service, so it’s likely that the leadership at your church hasn’t heard about it yet. Just as with YouVersion Live, Events is a completely free service that we’re happy to provide to churches. If you’d like your church to use Events, click below to let your church leadership know about it. How do I get Events? 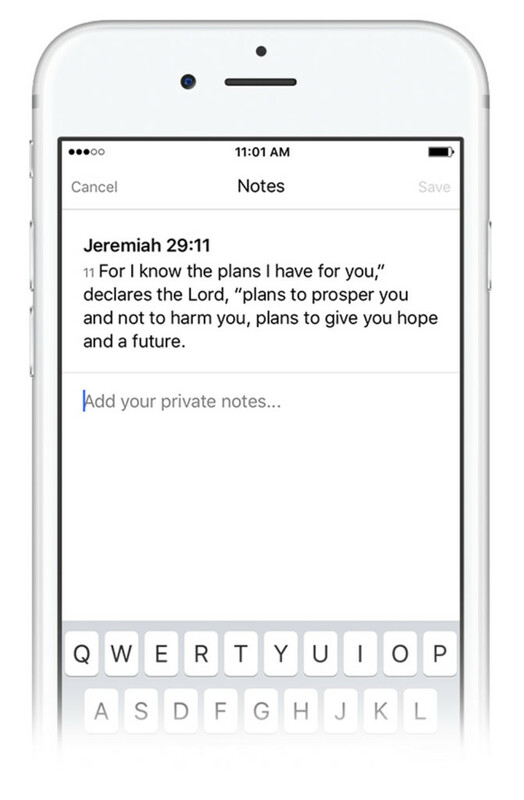 Events is a free feature in the Bible App. Events is all-new, so you need to make sure that you have the Bible App on your Apple or Android device updated to the latest version. Tell your friends about Events! Events is a completely free feature inside the YouVersion Bible App that helps you easily connect with church events that you’re attending. Events can also help you discover other church and special events happening nearby. If your church isn’t using Events yet, you can direct your church leadership to bible.com/features/events, where they can sign up for a free YouVersion account to begin creating their own Events. Our free administrative tools for Events make it easy for your church to share key message points, Bible references, artwork, external links, important church news, and more. I don’t see Events in my Bible App. Where is it? iOS: Events is under the More view (…) on your toolbar, after Videos. Android: Events is in the main menu, under Videos (tap the menu icon at the top left corner). If you don’t see Events, but you see a “Live” tab, then you are running an older version of the Bible App. Please update your Bible App to the latest version by visiting http://bible.com/app. Do I have to update my Bible App to get Events? Do I have to have a YouVersion account to use Events? You can search for and view Events without a YouVersion account. But, if you would like to take notes or save an Event, you must have a YouVersion account. Signing up is simple, and YouVersion accounts are completely free. A YouVersion account gives you access to all of the most powerful features of the Bible App — Bible Plans, Verse Images, Highlights, Notes, and more — synced across all your devices. Visit bible.com/sign-up to get your free account now. Does it cost anything to use Events? No. The Bible App has always been free, and it always will be. 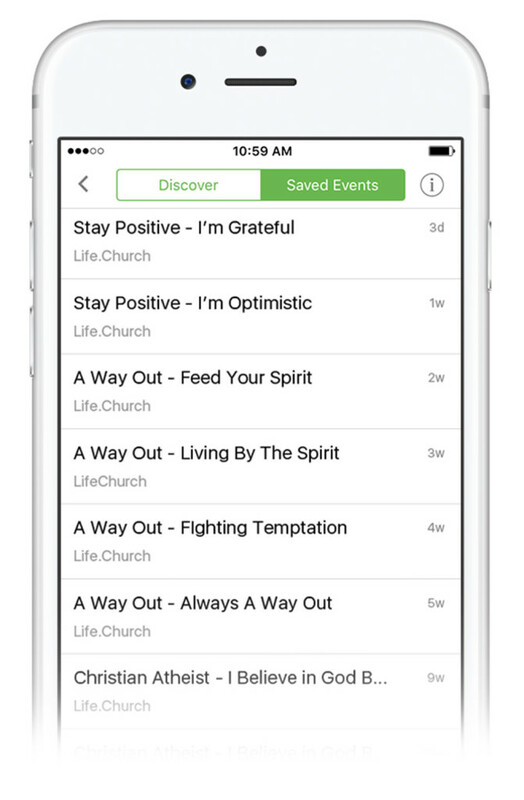 Although Events is an all-new service, it’s an integral part of the Bible App. 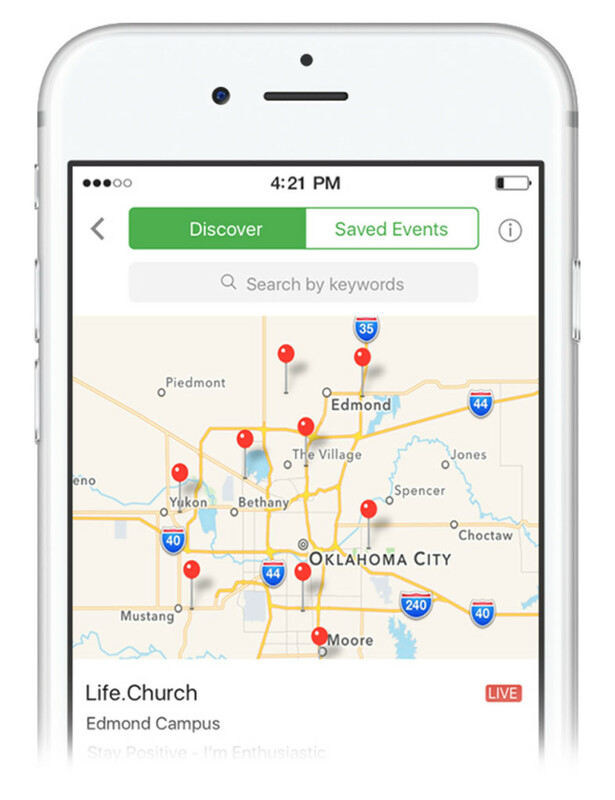 The Bible App needs access to location services on your device to find Events near you. If you’re looking for a specific Event and you know what it’s called, you can search using part of its title. Do I have to attend an Event to see it in the app? No. If you know an Event’s title or its location, you can search for it that way. But, the purpose of our Events feature is to help you engage more with Events that you attend. Can I see Events that have already ended? Yes, if you have saved the Event, or if you have a direct link to it. However, once an event has ended, it will no longer appear in Events search.